While the oven was on this evening I took some sausage mince out of the freezer, whizzed up a couple of brown onions, crumbed some stale bread rolls, beat some eggs and grabbed the mixed herbs from the spice cupboard. Then I remembered the pastry and quickly raced around the bench to get it out of the little freezer (you can't have sausage rolls without pastry, at least not in our house!). Put the pastry to thaw. Dumped everything into a big bowl and got my hands dirty. The easiest way to mix up sausage rolls is to use your hands (wash them first - hygiene and food safety and all that are important). I squished and squeezed and rolled and folded and squished and squeezed some more until everything was nicely mixed up and the mixture was smooth. We don't like lumps in our sausage rolls. Three sheets of delicious, buttery, puff pastry were cut in half. The mixture was divided into six. 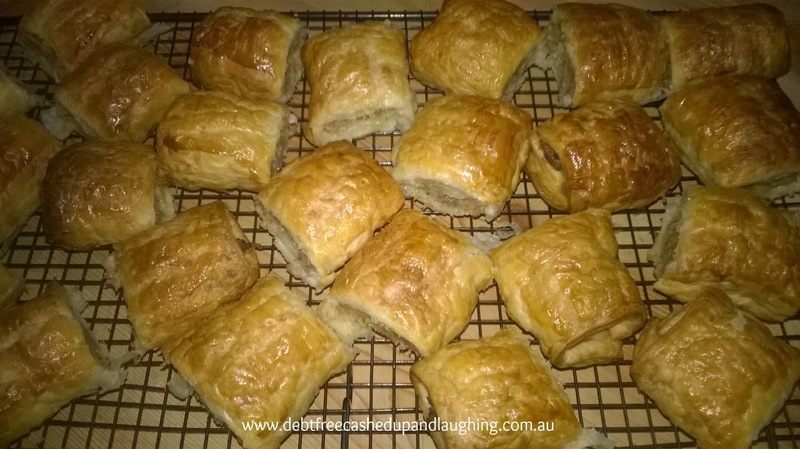 A big dollop of sausage roll mixture was dropped onto each piece of pastry. Then I washed my hands again and used them to make the "sausage" in the sausage roll. Rolled the pastry over each sausage and carefully lifted them onto a baking sheet. Another egg was sacrificed to make a golden egg wash. The six long sausage rolls were stabbed with a fork (helps with letting steam out when they're cooking, keeping the pastry crispy and delicious) and cut into four. We like medium sized sausage rolls - more than a mouthful but not too big to handle. They were coated in the egg wash and straight into the oven to bake to golden sausage roll perfection. I set the timer for 10 minutes and turned them. Set the time for 10 minutes and turned them and swapped shelves. You might have a fantastic oven and not have to do this. My oven is old. It works, but it has it's eccentricities I have to tend to. Set the time for 10 minutes and dug around in the cupboard for the cooling racks. Once the timer went off those golden logs of sausage perfection wrapped in pastry where whipped out of the oven and carefully (but quickly, I didn't want soggy bottoms) lifted onto the racks to cool. I'd made 24 mouth-wateringly good sausage rolls (but only 23 made it into the fridge - ooops!). Everyone has put their orders in for sausage rolls for lunch tomorrow so as long as the fridge fairies don't strike overnight packing the lunchboxes tomorrow will be easy. Pre-heat oven to 200 degrees Celsius. Line two baking sheets with baking paper. Combine all the ingredients until mixture is smooth. Use your hands, it's easier. Cut the pastry sheets in half. Divide the mixture into six and drop onto the pastry sheets. Use your hands to form the sausage. Roll the pastry over the meat. Place seam side down on the baking sheets, three to a sheet. 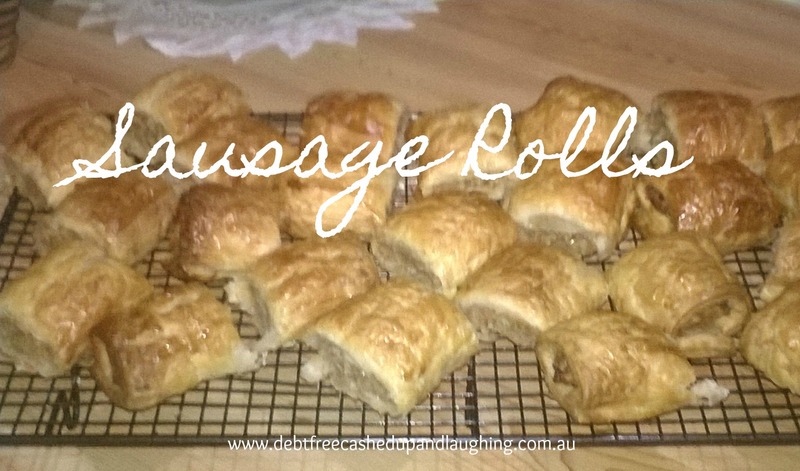 You need to leave lots of room between each sausage roll to allow the pastry to cook properly and evenly. Cut each sausage roll into four, not quite all the way through. Brush with the egg wash. Bake 30 minutes, turning regularly so the pastry cooks evenly. Remove from the oven and place on cooling racks immediately.